If you remember the Christmas carol Good King Wenceslas you heard the name. Stephen was a deacon in the early Christian church who was accused of blasphemy and put on trial by Jewish authorities in Jerusalem. After a trial in which he denounced them, Stephen was stoned to death. One of the witnesses to the event was Saul of Tarsus, who later converted and is known today as the apostle Paul. 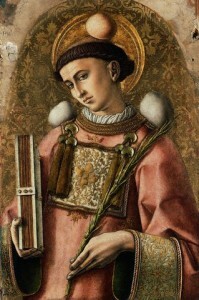 Stephen is considered the first martyr for the faith, the reason his feast day immediately follows the celebration of Jesus birth. All the major Christian congregations–Anglican, Catholic, Lutheran, Oriental Orthodox, and Eastern Orthodox–all venerate him as a Saint and celebrate the feast day (Western churches on 26 December, 27 Dec Orthodox, and 8 Jan Oriental Orthodox). In some countries (mainly Western Europe)it is a public holiday. In the United Kingdom, Australia, Canada, and New Zealand it is celebrated as Boxing Day, a secular holiday that falls on the same day as Feast of Stephen. Traditionally it is the day in which servants and tradespeople receive the “Christmas box” from their employers. While that tradition may still hold true, it is either a second Christmas day for some or an extra shopping day (though in some countries it apparently is a day when a lot of returns to retailers takes place). It is also a major sports day as well.